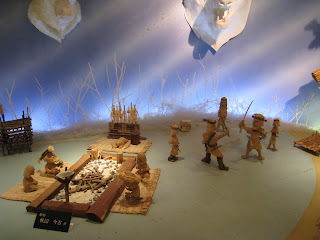 One of my main goals in Hokkaido was to learn more about its indigenous people, the Ainu. 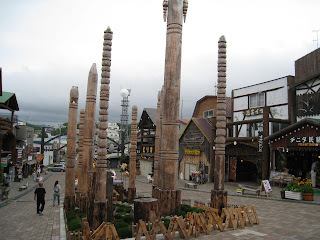 A Japanese friend told me of a village in the east of Hokkaido, that while being touristic overloaded, represents one of the biggest Ainu communities, which try to preserve their culture and let the world know about it. 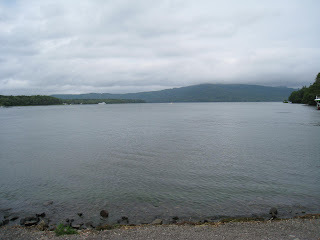 The name of this village is Akan, named after the great lake Akanko on which's shore it is located. 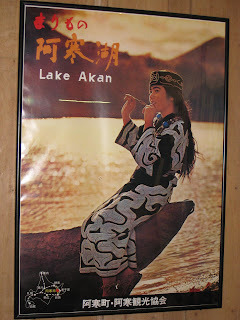 Akan is indeed a village, because it is really small. There are basically two streets and one path. 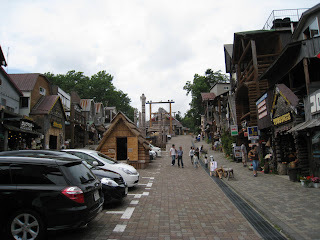 One street is the highway on Akan's north border, the other is its main shopping street, the "center" of Akan, and last the path leads along the wonderful lake and then into the mystical forest. 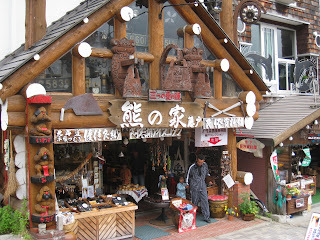 Being touristic overloaded means the central street is plastered with tourist shops, which however, look really nice, are mostly lead by real Ainu descendants and mostly sell items handcrafted by the owner. 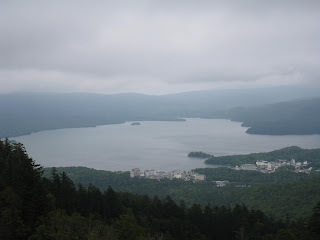 Apart from that there is the Ainu Kotan, the traditional Ainu village, around which the rest of the town was built and the lake, which contains its own little mystery: the ball shaped algae called marimo. 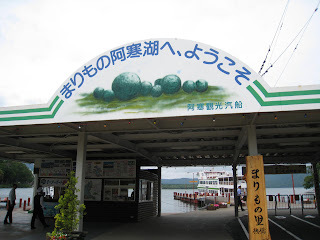 On the lake you can take an expensive boat ride, which will take you to a little island in the center of the lake, which hosts a marimo museum. 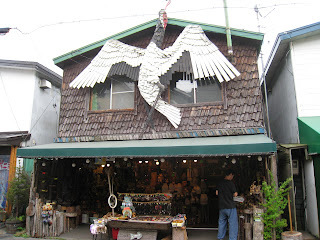 There are also two convenience stores, which also function as restaurants and offer Ramen and some other dishes. 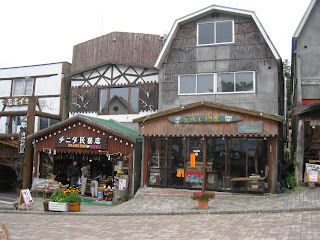 In the far end of the village you can find a tourist information, which has maps of the place and information about all the facilities. 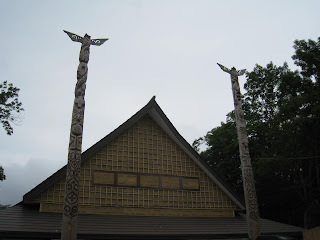 Concerning the Ainu there are two museums, one about how they lived, and one about their harmony with nature and their arts. 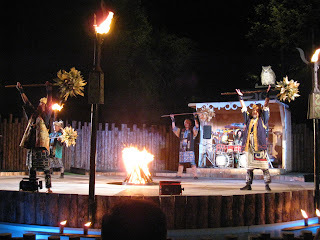 There is also one inside stage, where they perform their traditional dances, and one outside for concerts. 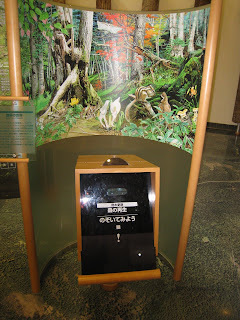 Lastly there is one more museum about the ecology of Akan, which is free of charge. 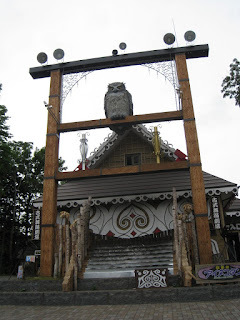 For lodging I can recommend either to use the Camping Place or the incredible cool Rider House, led by an ancient Ainu for 500 Yen a day including breakfast and dinner. 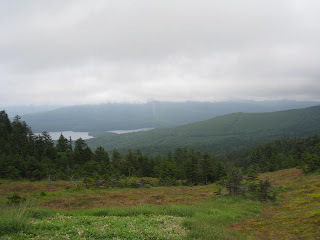 Kotan is the Ainu word for village or settlement. 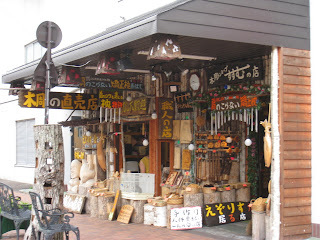 Akan's Ainu Kotan extends the shopping street and hosts some more exclusive shops, all run by Ainu. 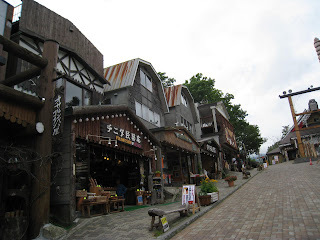 It is the original village, today's Akan grew out of. 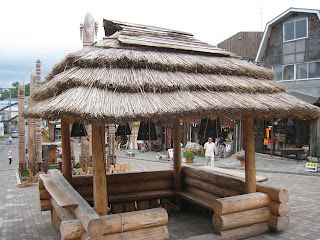 In the center of the Kotan you can find a wooden hut, where at night around 8 pm, you can take pictures of yourself with an old Ainu Shaman for free (which happens to be the owner of the Rider House). 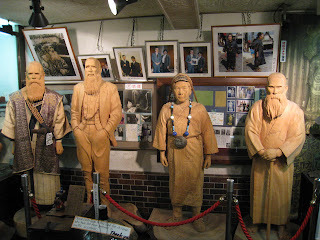 When you face the big stage house the sixth shop to your right (熊の家 Kuma No Ie), also hosts a little museum in the basement dedicated to a talented Ainu artist who specialized in wood sculpturing. 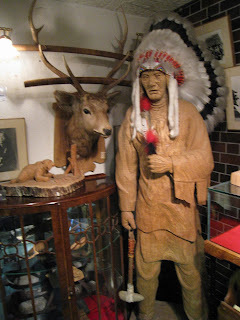 So in the basement, you can find many samples of his work, followed by information about him and the arts the Ainu. 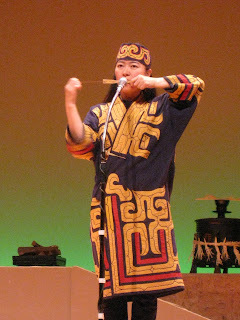 Apart from that, there is one thing I recommend you buying: The ムックリ Mukkuri, a traditional instrument of the Ainu made of bamboo. You can get one for 400 Yen, but be sure to ask the friendly shop owner to give you a quick course in how to play it, because it is really difficult, as I had to find out. 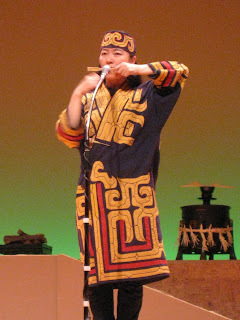 The Ainu have a lot of traditional dances, some of which they perform on the stage at the top of the Ainu Kotan. 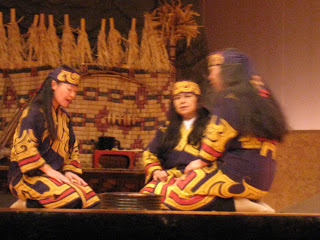 Along with the dances, some women sing songs in the Ainu language, that have been preserved, when the language was just at the brink of being forgotten. 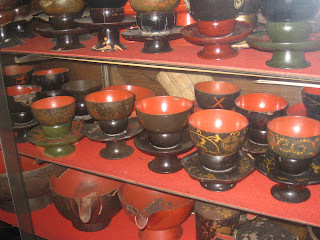 It sounds completely different from Japanese and has its very own distinctive sounds. 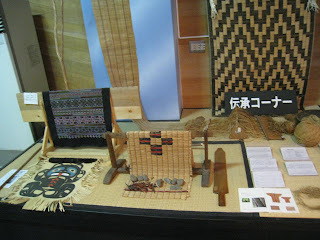 They also made music using the ムックリ Mukkuri, I mentioned before. 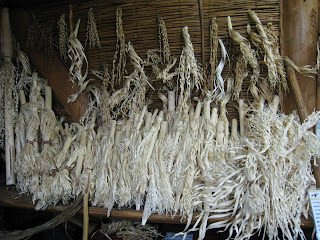 it is incredible which variety of sounds and melody they can create with a little piece of bamboo. The Mukkuri resembles the European Jew's harp. 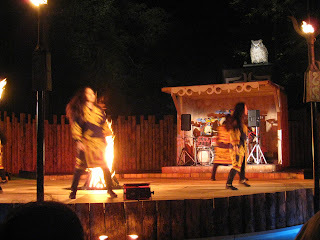 The dances reflect the Ainu's lifestyle or being rather calm and harmonious in contrast to energetic and ecstatic. 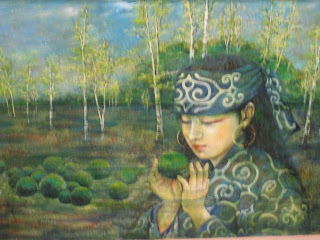 Many dances in the Ainu culture are about animal mimicry, as the Ainu always tried to live in harmonious coexistence with the animals. 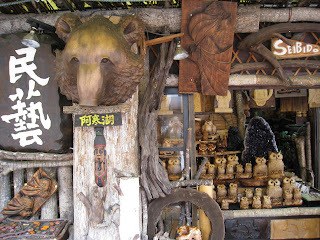 The two most important animals were the bear and the owl. 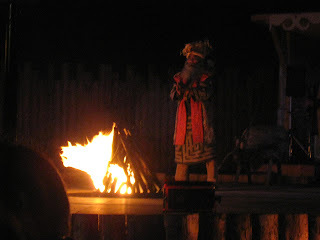 Apart from the dances, they also showed the alcohol brewing ritual, very important to the people of the cold north. 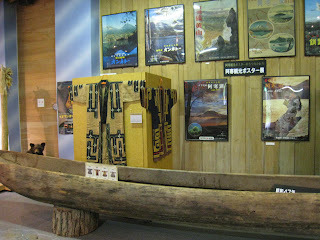 In this museum you can experience how close the Ainu lived to nature. 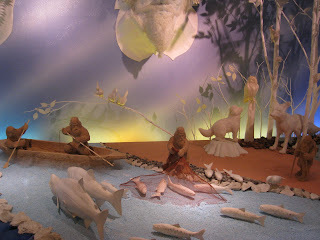 Everything they did was in harmony with the animals and plants around them and in synchrony with the current season and weather. 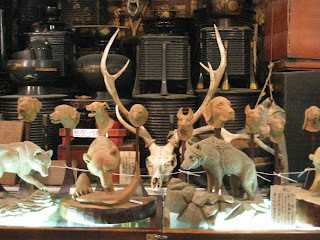 The museum tries to explain this mutual relationship, that has been lost to modern civilizations. 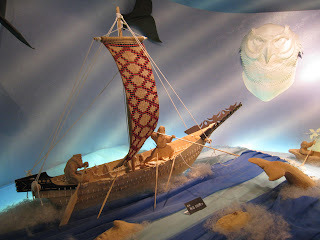 This is also reflected in their art, of which you can find some examples in here like wood carvings or paintings. 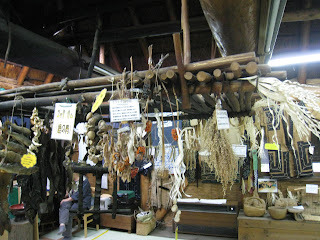 The second museum reflects the daily life of the Ainu and exhibits many daily tools used for cooking or crafting. 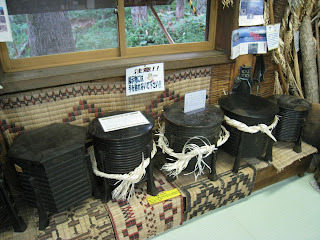 Some other tools were reserved for ceremonies, like alcohol brewing. 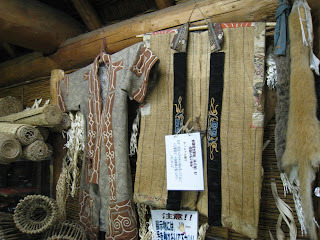 You can also see a selection of Ainu clothings and typical food. The lady inside gladly narrates you more, when you ask her for it. The highlight of the day was the concert at the evening. For two months a representative of the Ryukyu kingdom, which was conquered and occupied by Japan and is now known as Okinawa, was visiting Akan for cultural exchange between two oppressed people. 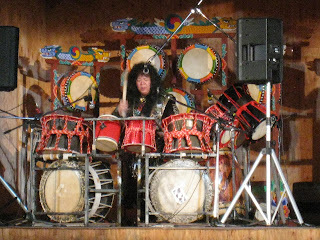 Since he is master of 太鼓 Taiko (big drums) and brought his drum set with him, they decided to make a cultural mixed ensemble between Ryukyu music and Ainu singing and dancing. 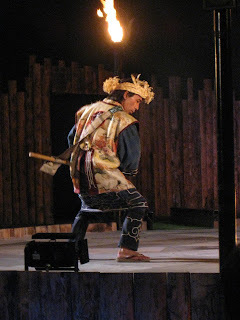 Altough it didn't perfectly fit, Ryukyu music being energetic, loud, fast and ecstatic and Ainu dancing and singing more slowly and contemplate, the combination was more than just interesting. I enjoyed both the music and the dancing and even liked the disharmonic mix of both, which had its own flair. 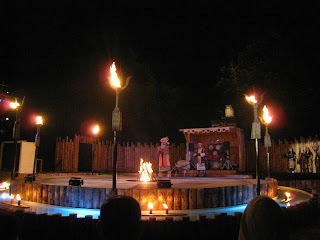 And they put real effort in it and created a stream of water carrying torch floats, prepared pyro effects and a really cool outside stage. 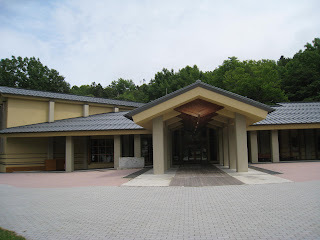 I talked a lot to Miyanga-san, the drummer from the Ryukyu islands, and we quickly became friends. I found out that he plays in two famous Japanese Rock Bands: Murasaki and Zodiac. I noticed that he was into Rock, both from his appearance and the music itself of course. 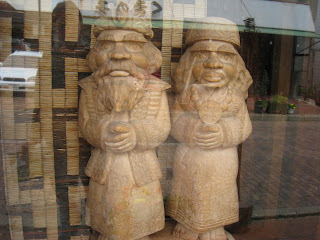 He told me that Okinawa was an independent country called the 琉球 Ryukyu kingdom. 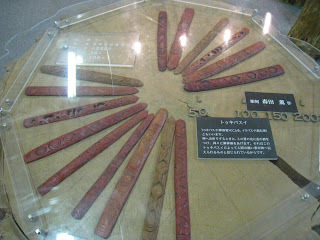 They used Kanji like China, but had their own language, which is till spoken by elder people on the islands. He told me that Ryukyu people were forced to assimilate Japanese culture and speak Japanese as mother language. 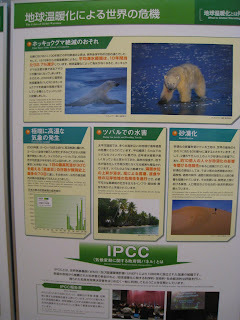 But the spirit of the islands lives on, and there are quite a few left who want independence from Japan. 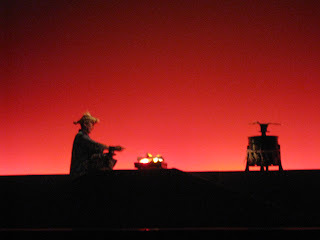 He invited me to come to Ryukyu once and explore the culture and history of his people. I can't make it this time, but if I ever make it back here, I am sure to heed his call. 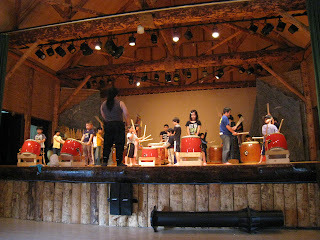 The next morning I was awakened by the sound of Taiko drums. When I curiously checked where the sound came from, I saw Miyanaga-san teaching a crowd of cute little children how to play Taiko. I sat next to the proud parents in the audience and listened to their performance. They were quite good actually. 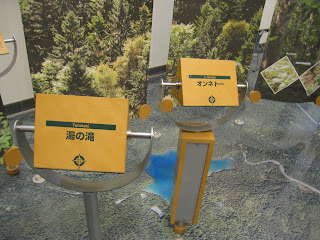 After that I talked a little more to Miyanaga-san and then we bid each other farewell. 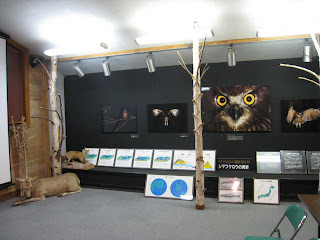 At the other end of the village, where it starts fading into the forest, you can find the free ecology museum. 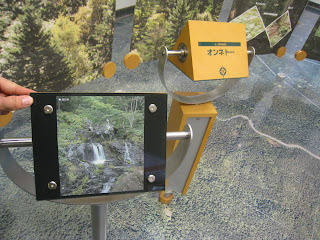 It tries to teach you about Akan's nature, vegetation and animals. 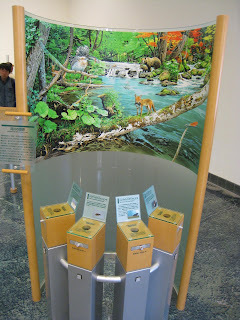 It has some exhibits, but mostly tries to arouse your interest with little interactive contraptions, that teach you about different aspects of the ecology. 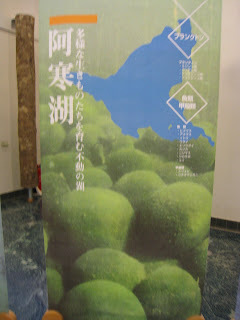 Especially noteworthy are the green algae balls that grow inside lake Akan. They are perfectly round and a true mystery. 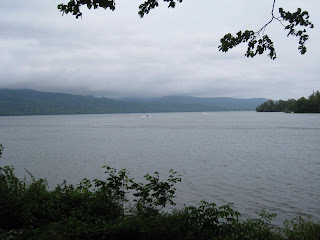 People tried to let them grow in labs or on other lakes, but all failed. It seems to be a delicate mix of external factors that make lake Akan the only place where those little balls can grow up. They can be as small as a rice corn, but the biggest one found was already the size of a soccer ball. 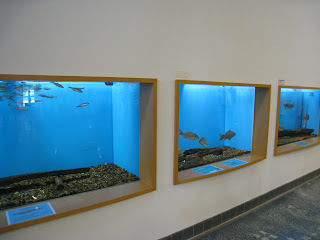 They also seem to grow in colonies next to each other, which makes them even more unique. 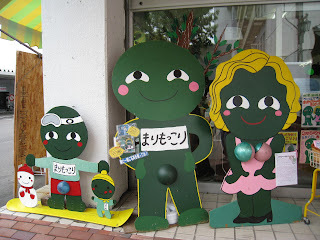 As it is Japanese custom, the marimo are touristic exploited and you can buy very ugly まりもっこり marimokkori mascots in the main shopping street. 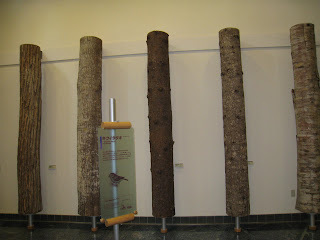 Lastly the museum does not fail to show its visitors how the ecology all around the world is more and more destroyed by the humans, and that is is in fact our fault for producing huge amounts of waste with our lifestyle, and even more waste and destruction for the production of the waste we are consuming and then throwing away again. 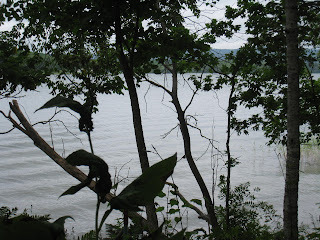 I didn't take the boat ride, but I recommend you to at least walk around the lake's shore, and follow the path through the forest near the ecology museum, because it is really nice to walk on, and it gives you nice views on the lake. 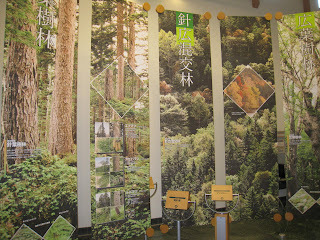 If you are up for a little walk through nature, I recommend you following the 白湯山 Hakuto Mountain trail on the map. 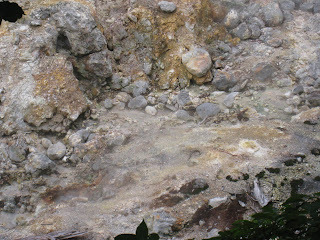 One warning, concerning the location of Mount Hakuto, the map is largely inaccurate concerning distances. 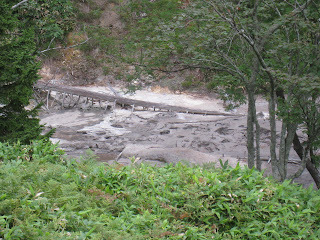 It looks like lying right next to the Akankohan observatory, but in fact it is 4 kilometers away. 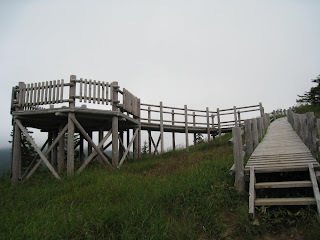 the Akankohan observatory is closer and a good start, but I recommend you climbing the mountain to the second one, because the path to it goes through Akan's national park and is really wonderful. 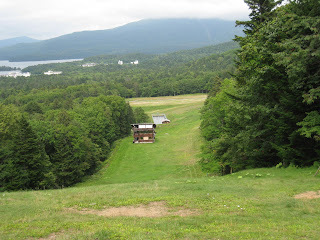 Don't be deterred by the first huge steep climb up the ski hill to the beginning of the walking path. 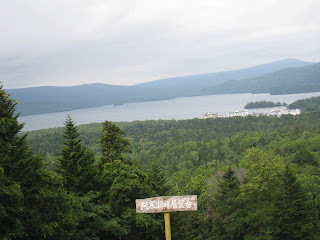 After you managed this first tough part, the walking trail mostly continues flat and only makes moderate ways upwards. 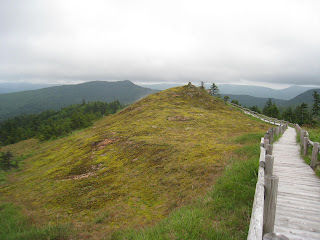 It leads through the national park and offers you really wonderful scenery on both sides. 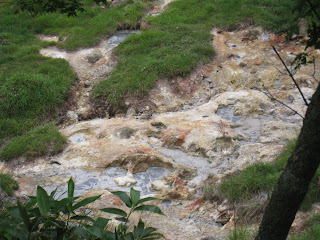 Exceptional are the five ふれべつポッケ Furebetsu Pokke Sulfur Springs, you will come across when climbing uphill. 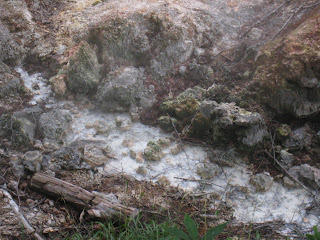 You can smell them from a far and see the sulfur steam rising into the air. 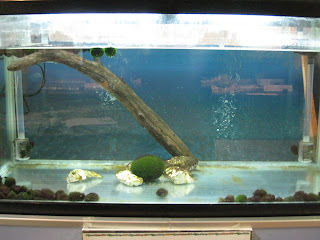 All area next to them has dies because of lack of oxygen and looks like barren wasteland. 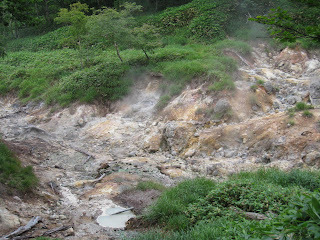 A wonderful sight and refreshingly not as touristic exploited and shielded as 大湧谷 The Big Steaming Valley in Hakone. 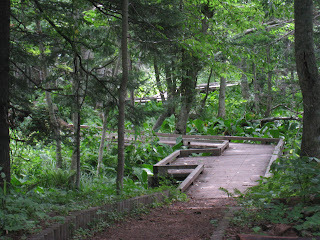 However walking through national parks has its dangers, and I was happy not to walk this path alone. 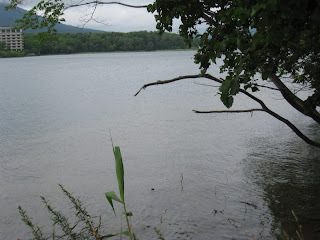 A snake appeared on the way and hissed at us. I jumped back in fear, but my courageous Japanese companion quickly fixed the snake's head with his shoe to the ground and then took head in one hand and tail in the other. 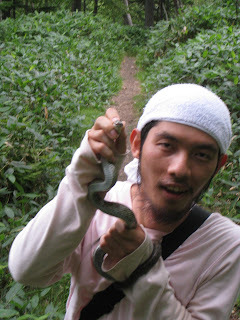 Now the snake was no longer dangerous, and I even could take a picture of my friend Takayuki holding the snake. However we could not relax as later we were assaulted by a killer bee. I first mistook it for an ordinary bee, as it is not much larger and maybe a little blacker than your ordinary honey bee. 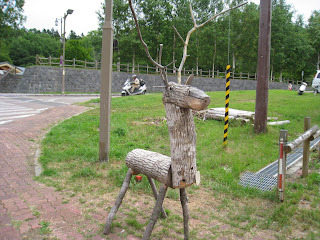 But Takayuki grasped the situation and quickly and shouted at me: "Zettai Ugokanaiyo" (Whatever you do, don't move!). The bee continued circling us for what seemed like 5 minutes until she eventualy allowed us to strove on. Later Takayuki explained me: "If you are stung once by a killer bee, you will probably survive, but you will be in pains for days. If you are stung twice, your death is certain". *gulp* Paying a little bit more attention now, we strode on to the top and had in fact a really incredible wonderful view on Akan lake and the larger area. 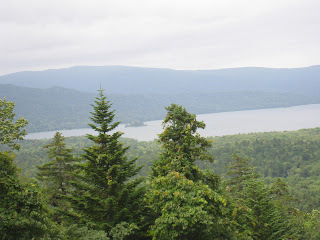 Although Akan is surrounded by national parks and boundless nature, I recommend you to erect your tent on the camping ground in Akan. 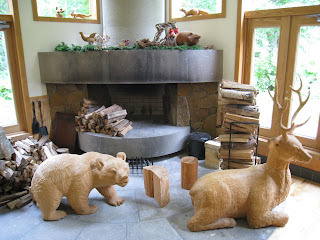 The reason is afore mentioned dangers the boundless nature holds, especially bears. 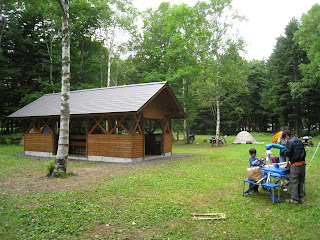 Within the camping place you are relatively safe, because it is fenced and most animals avoid big crowds of people. 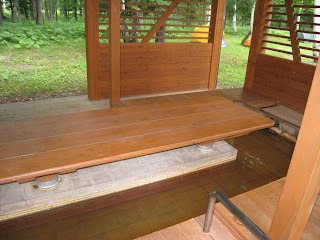 Also the camping ground has facilities like toilets, water and even an 足湯 Ashiyu (Onsen/Hot Spa for the feet). 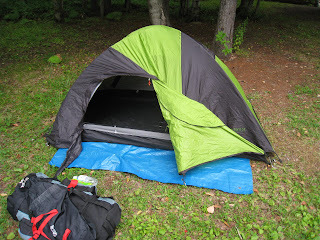 However you have to pay 500 Yen, when you leave the camping place. 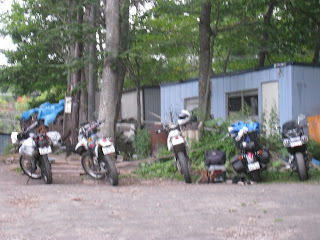 On my second day Miyanaga-san gave me a secret tip, to try the Rider House for lodging. 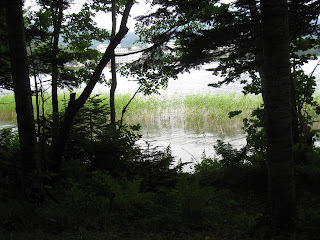 It is hidden behind other houses and not to be found on any map. 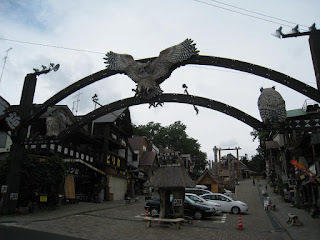 It is lead by a very old Ainu Shaman and intended for hosting bikers. 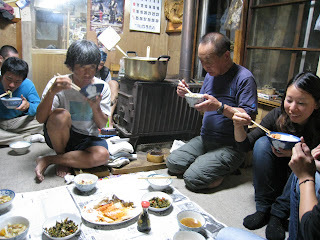 But the old guy also accepted me, and I gladly moved in. The house looks really old and has a lot of charm. 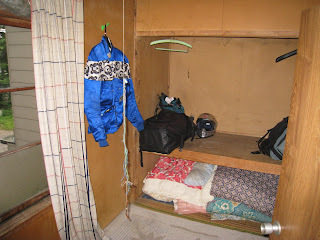 Inside on the second floor, you can find many tatami rooms, in which you can sleep. Futons are also ready for usage. 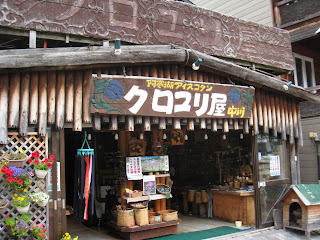 The night is only 500 Yen, and breakfast and a large dinner are included. I think the guy is supported by other villagers, cause otherwise I can't see how he could run his house like this. 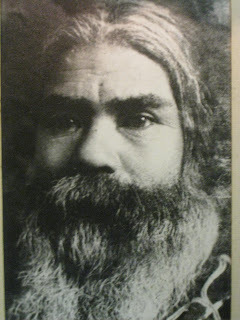 But then he is an old Ainu and needs nothing to live but food, water and love. 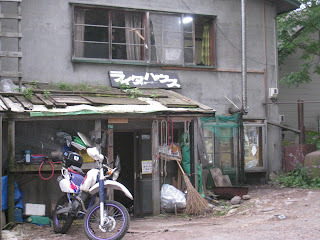 And why not share your house with everyone, so that whenever you want, you can enjoy the company of people traveling all over Japan in their bikes and having many good tales to tell. Also incredible is that the whole house runs on customer to customer service. Meaning when I moved in, an already present guest told me about the 500 Yen, that I should simply lie them on the table in the main room, that I should write my name in the guest book and make a circle for paid. Then he showed me a room and told me about breakfast and dinner. Also when the telephone rings, and a biker is asking for the way, other guests will take up the phone and explain it. Even the cooking and the dish washing is done by guests (and remember we are talking about leather jacket wearing bikers). 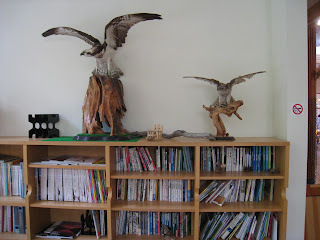 This wonderful way of managing things by trusting the guests to manage them themselves truly amazed me. 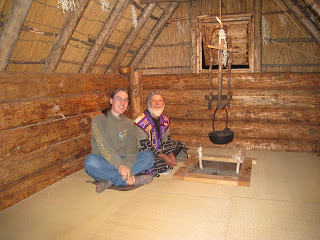 In Akan learned a lot about the Ainu and made many friends. I was really lucky, always to crush into interesting people wherever I go. 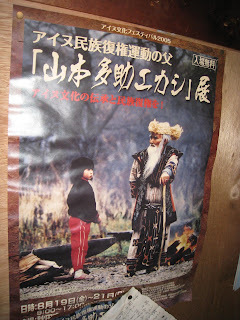 I will try to write a post about the Ainu, and the stories they told me. From Akan I hit the road again. 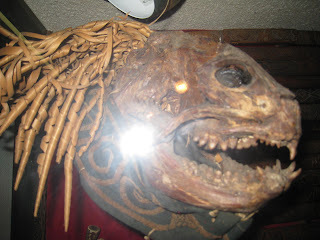 found your blog by chance and enjoyed it a lot - you really seemed to have got into the Akan community rather than just passing through as most visitors do - great! 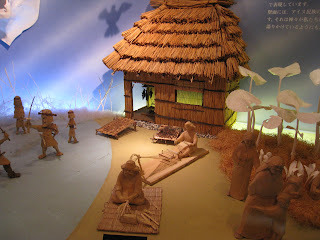 what was your impression of the Ainu people?